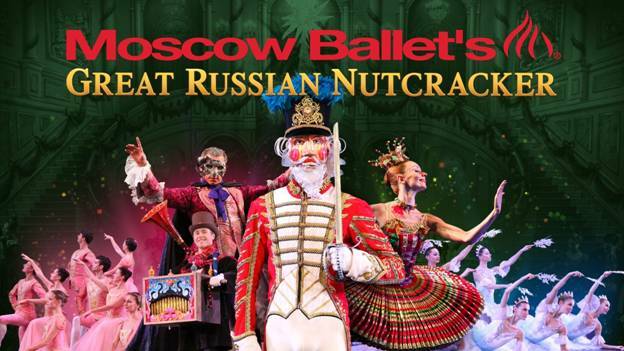 CUPERTINO, CA – On the evening of December 20th inside the auditorium of the FLYNT CENTER the once-upon-a-time magical story of a wooden nutcracker, shaped like a soldier, who turns into a life prince on Christmas eve, was masterly danced by the Moscow Ballet to a recording of the NUTCKRACKER BALLET written by Russian’s composer PYOTR ILYCH TCHAIKOSKY. Joining the cast, were a number of young ballet dancing students from Cupertino, Saratoga and other South Bay cities, who as part of the “Dance with Us” program from the MOSCOW, had the unique opportunity to dance on the same stage with the professional dancers of the MOSCOW BALLET'S GREAT RUSSIAN NUTCRACKER. Part of the eye appeal that this year's GREAT RUSSIAN NUTCRAKER brought to Cupertino this year, aside from the excellence of their dancers and the elegant elaborate costumes, were their backdrops. which on its 2016 National Tour were many, and very elaborated. There was the inside of Drosselmeyer’s studio, which opens the ballet, where we see him putting the finishing touches to his life-size toys: a sweet Kissy Doll (ANNA TYUTYNNIK) and a funny Harlequin, (RAFAEL URAZOV) which walks in the wrong direction all the time. Here we should mention that both dancers need to dance their part simulating toys, which means, moving their their arms and legs like dolls do, without bending them, making them look mechanical, which both did. Beautiful to look at on that night, was the backdrop with a painting of the rod iron gate that surrounds the Stahlbaum’s house, because as when we look at it, we can see the Russian skyline of golden domes in the background. Added to the creatove backdrops this year were the projections, which in the “Snow Forest”, ballet were hundreds of enormous snowflakes falling on the snow covered forest, where on the front of the stage, little girls, dressed in white, lay on a line holding their heads on their bended shoulders, as the adult dancers, also dressed in while, dance in the background. The scene look magic. The principal dancers were impressive. Dancing the role of Masha (as the Stahlbaum's daughter is called in Russia) was ALISA VORONOVA, dancing the role of Prince by DMITRY KOZHEMYAKIN, Uncle Drosselmeyer was danced by IGOR BULICHOV who as part of his dance, marched on the stage raising his strong legs. The rat King VLADIMIR SUDOMLYAK, and dancing the famous Dove of Peace pas de deux ALEKSANDRA TEMNENKO and MIKHAIL PERFILOV. 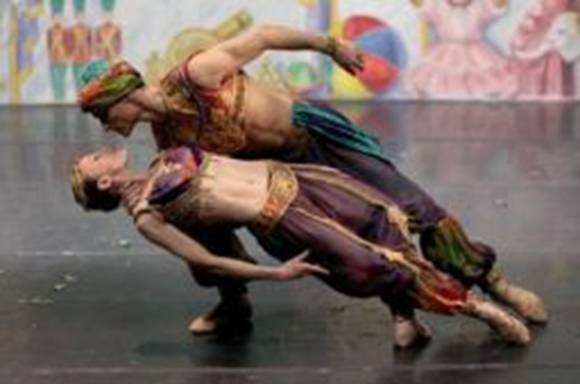 Here we should add that on that night, VORONOVA and KOZHEMYAKIN in their roles as Masha and Prince, gave the audience some of the most beautiful “Fish Figures” in ballet, one of them ending with DMITRY holding VORONOVA in the palm of his hand as she stood up. Their solo dancing, He doing high jumps around the stages and opening his legs to his sides and she spinning rapidly in pointe (foot points) around the stage, were masterful. Their Grand pas de Deux at the end, marvelous. The “Variations) the dances from the different countries that Masha and her Prince visit during their journey. Were well danced by the dancers, but some were better than others. On that night, EMMA BOWMAN dancing the Spanish Variation with AERYM OVANEZIAN were not always on the beat of the music. 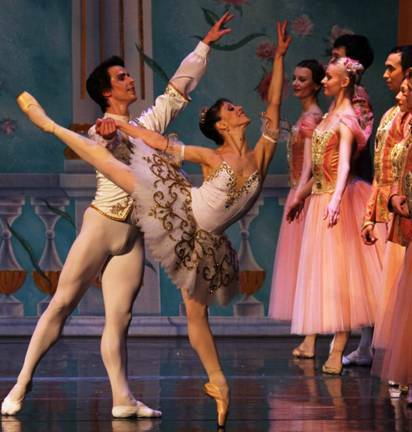 The French Variation danced by NATALIA IVASENKO and RUSTEM IMANGALIEV was very elegant. The Chinese variation, danced by ANNA TYOTYUNNIK and RAFAEL URAZOV, done with lots of jumps, was cute, and the Arabian Variation performed my Maria RYAZANTSEVA and BOGDAN CHABANUK, Superb. 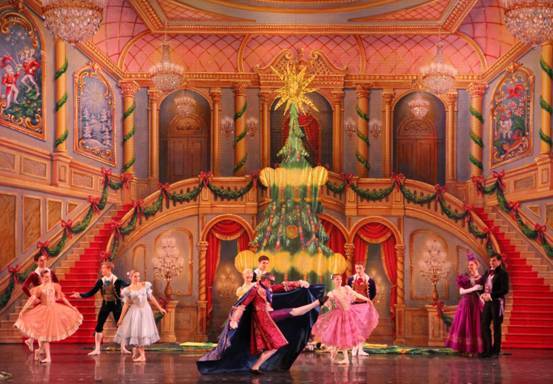 The GREAT RUSSIAN NUTCRAKER continued in a series of dances performed by groups and by the principal dancers. At the end, it went around in a complete circle, when the story bring us back to the Stahlbaum’s house, where Masha wakes up in her bed, and seeing her nutcracker wooden doll laying on her bed next to her, picks him up on her arms and cuddles him tenderly as if realizing that her trip with a Prince, to all those beautiful lands, was nothing but a dream.